Singapore Society of Radiographers - 3rd SSR Annual Scientific Meeting presented by Sengkang General Hospital google-site-verification=6eg37azjhvwaxcy2doqbopjwffmjhez5xkz5jupnypg23zq3m7la.mx-verification.google.com. Complimentary ticket for SIT staff to attend the 3rd SSR Annual Scientific Meeting. All speakers may register under Speaker's registration for SSR 3rd Annual Scientific Meeting, inclusive of pre-conference workshop (limited to availability). Remember to key in the registration code given to you. Student Members enjoy heavily discounted rates to attend the 3rd SSR Annual Scientific Meeting presented by Sengkang General Hospital. Please bring along your metriculation card for confirmation on event date. Students enjoy heavily discounted rates to attend the 3rd SSR Annual Scientific Meeting presented by Sengkang General Hospital. Greetings from the Singapore Society of Radiographers! 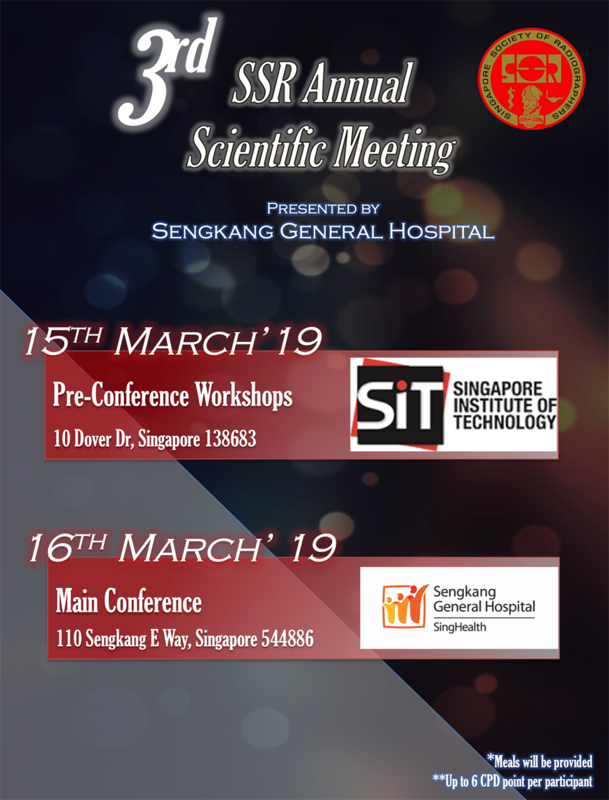 In a joint collaboration with Sengkang General Hospital, we are proud to present the 3rd SSR Annual Scientific Meeting presented by Sengkang General Hospital. Make your way down to Sengkang General Hospital Auditorium on the 16th March 2019 to attend!